Froggy Boots Go With Everything is a fun board book that will inspire little ones, especially those who have a beloved item, like my little guy’s blankie. Jacob, age three was just captivated by the delightful illustrations by Kirsten Gaede Van Mourick and the engaging yet simple text by author Jill Zabkar Martin. As the young main character goes on daily adventures in his favorite rain boots, he is accompanied by a cute little frog who manages to make his way into every scene. It was adorable to watch my son jump up and down shouting “there he is” whenever he discovered the adorable frog on a page. My older kids ages 4 and 6 were able to relate to the young boy and his fun daily activities so they really enjoyed this book too. I love how this book is interactive and even includes a “Can You Find” game that my three children enjoyed playing time and time again. 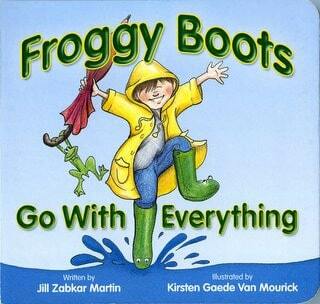 Froggy Boots Go With Everything is a great addition to your spring and summer reading list and is sure to be a hit. My children and I have had a lot of fun reading this book and it is perfect before nap time or on a rainy day! You can purchase Froggy Boots Go With Everything for only $6.99. My favorite rainy day activity is playing board games with the kids. I ‘like’ Simply Stacie on Facebook. Our favorite rainy day activity is baking cookies or homemade bread together, then curling up with a good book, our fresh baked treats and a glass of milk. Reading books is our favorite rainy day activity. My children love to run around and splash in puddles, and I love watching them do it from the dry porch. 🙂 If the weather is too bad to play outside, we like to bake. I liked Simply Stacie on Facebook.